Pasta Carbonara with an exotic twist. 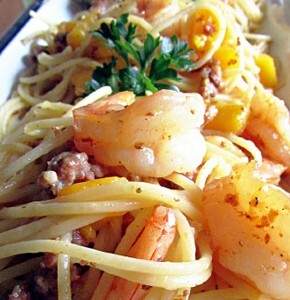 Mouthwatering combination of Shrimp, Bacon, and Mango in a wine based sauce served over pasta. Hello Ursula, thank you for sharing my recipe for Shrimp and Mango Pasta Carbonara with a link back to my website! I hope you enjoy the recipe. Please let me know how it turns out for you, I’m always eager to hear how my recipes turn out for others. Your comment ended up in my spam folder so it took me a while to find it. Sorry for the late reply! It just sounded to good not to try.